Comment: It should be noted that most if not all true Christians martyred for their faith in Jesus Christ would not deny Him as their Lord. They were not attempting to overthrow governments, but rather were trying to help individual people be freed from the sin and condemnation that every person experiences when separated from God. They were crucified for doing good and not evil in contrast to many "religions" that expound the forcible conversion of unbelievers. While it is true that some "so-called Christians" at times in the past did try to force conversions this was never a teaching of Jesus Christ. Again, this is in contrast to some leaders of other movements who have expected their followers to forcibly convert others. 20 "According to my earnest expectation and my hope, that in nothing I shall be ashamed, but that with all boldness, as always, so now also Christ shall be magnified in my body, whether it be by life, or by death. 24 Nevertheless to abide in the flesh is more needful for you." KJV online. "PLEASE NOTE: We have placed Foxe's Book of Martyrs among our list of good books to read and study for two reasons: 1) not to cause doubts as to whether you will be able to endure the same persecution, but to show you how God's followers were able to face and endure all kinds of persecution because of their faith in God! Remember, Christ said: 'In the world ye shall have tribulation: but be of good cheer; I have overcome the world. 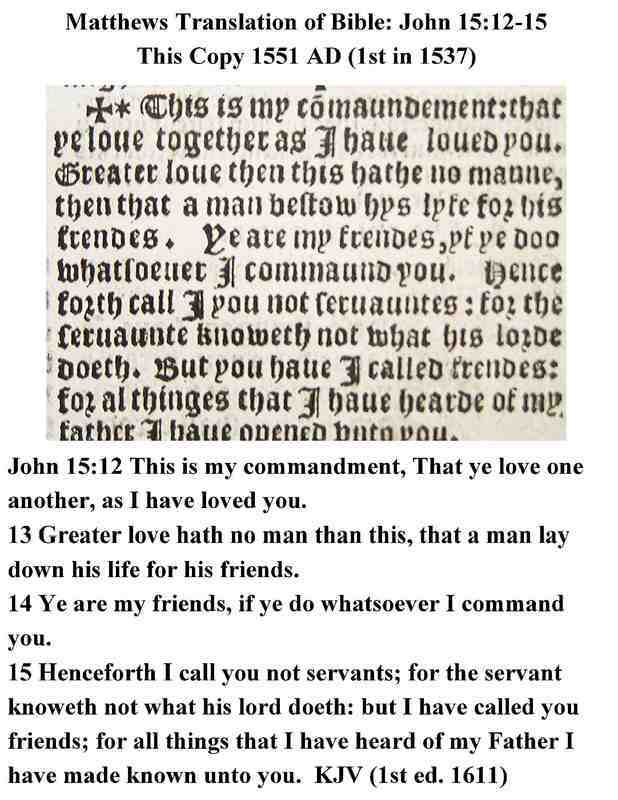 'John 16:33. Instead of fear, this brings encouragement to the faint of heart, and as we see what others have endured for the truth of God's word in the past, we know that with and through Christ we can do the same. 2) Lest we forget! 'If we divest the book of its accidental character of feud between churches, it yet stands, in the first years of Elizabeth's reign, a monument that marks the growing strength of a desire for spiritual freedom, defiance of those forms that seek to stifle conscience and fetter thought.' - Henry Morley, 'English Writers'. 'After the Bible itself, no book so profoundly influenced early Protestant sentiment as the Book of Martyrs. Even in our time it is still a living force. It is more than a record of persecution. It is an arsenal of controversy, a storehouse of romance, as well as a source of edification.' - James Miller Dodds, English Prose." Christians are being martyred for their faith in Christ all over the world but none so graphic than in Mosul Iraq.Young men are being crucified if they attempt to leave Islam. I have attached a link to a site that verifies these atrocities. It is gruesome but accurate as best as I can ascertain. If more information is available please notify me. ... Elliot professed faith in Jesus at the age of six and grew up in a home where obedience and honesty were enforced. The Elliot parents encouraged their children to be adventurous, and encouraged them to "live for Christ". "Elisabeth Elliot (née Howard; born December 21, 1926) is a Christian author and speaker. Her first husband, ﻿Jim Elliot﻿, was killed in 1956 while attempting to make missionary contact with the Auca (now known as ﻿Huaorani﻿) of eastern ﻿Ecuador﻿. She later spent two years as a missionary to the tribe members who killed her husband. Returning to the United States after many years in South America, she became widely known as the author of over twenty books and as a speaker in constant demand. Elliot toured the country, sharing her knowledge and experience, well into her seventies." From Wikipedia. "Nathanael 'Nate' Saint (August 30, 1923 – January 8, 1956) was an ﻿evangelical Christian missionary pilot﻿ to Ecuador who, along with four others, was killed while attempting to evangelize the Huaorani people through efforts known as Operation Auca...Nate Saint was born in 1923. When he was seven he took his first plane ride with his brother Sam, who would eventually become a commercial pilot for American Airlines. While in the airplane he discovered a love of flying. ...In September 1955, Nate was joined by his teammates, Jim Elliot, Ed McCully, Pete Fleming, and Roger Youderian. Saint finally found a [Huaorani also known as Aucas] settlement while searching by air. To reach the tribe, Saint and the team lowered gifts to the Huaorani in a bucket tied to the plane. ... Finally, the missionaries decided to try to meet the Huaorani on the ground; and, on January 3, 1956, using the beach as a landing strip, they set up camp four miles from the Huaorani settlement. Their initial contact was encouraging; however, on Sunday, January 8, 1956, the entire team was killed on the beach (known as 'Palm Beach') when armed Huaorani met and speared them. Nate's son, in 1995, took his family back to stay among the Huaorani people to minister to them. As far as I know he remains among them. ...In the fall of 1955, McCully, along with Jim Elliot and missionary pilot Nate Saint, began Operation Auca, their plan to reach the previously un-contacted Auca Indians... after friendly ground contact with three Aucas, the missionaries were attacked by a party of six Auca warriors and three women. McCully was speared by a young Auca namedMincaye, and also severely mutilated with a machete after he grabbed and tried to hold back one of his attackers. His role is described in the 2006 film End of the Spear. ...At the time of Ed's death, Marilou was eight months pregnant with their third son, Matt. She returned home to give birth and to meet with family. Ed McCully's memorial service was held at his home church in Wauwatosa, Wisconsin, and drew around 800 people. Marilou eventually returned to Ecuador and lived in Quito for 6 years, running a home for missionary children. She later returned to America and settled in Washington State where she worked as a hospital bookkeeper. She never remarried, and died of cancer on April 24, 2004." From Wikipedia. ...In September 1955, Fleming joined with Elliot and three other missionaries in Operation Auca, an attempt to reach the Auca Indians with the Gospel...According to reports, Fleming was speared by Kimo, a man who later became one of the first Auca converts to Christianity. Four years before his death, he wrote in a journal 'I do want to be committed to the work there laying down my life for their faith.' Some of the Quichua Indians and even some of the Auca killers came to saving faith in Christ." From Wikipedia. Olive Fleming Liefeld, widow of the missionary Peter Fleming, relates her version of the events already familiar to readers of Elisabeth Elliot's Through the Gates of Splendor. Olive describes details of the fateful trip in 1956 during which Pete, Jim Elliot, and three others were killed by Waorani Indians in Ecuador.In 1989, Olive returned to Ecuador and met the Indians." From books online called GoodReads.com. I have not read this book but the review sounds good. ...He worked with missionary pilot Nate Saint to provide important medical supplies, but after a period of attempting to build relationships with them, he failed to see any positive effect and, growing depressed, considered returning to the United States. However, during this time, four other missionaries in Ecuador were planning Operation Auca, an attempt to reach another group of people, the Auca. Nate Saint approached Youderian about joining their team to meet the Auca, and he assented. A beautiful Summary of the Impact of those Five Men-see link below with pictures. This section will be further amplified in weeks to come.But, many scholars of the Languages gave up their lives to translate the Bible written in Hebrew/Greek into the common language of people groups around the world. Below are a few examples. "Polycarp (﻿Greek:﻿ Πολύκαρπος, Polýkarpos; AD 80 – 167) was a 2nd-century Christian bishop of Smyrna. According to the Martyrdom of Polycarp he died a martyr, bound and burned at the stake, then stabbed when the fire failed to touch him. Polycarp is regarded as a saint in the Roman Catholic, Eastern Orthodox, Oriental Orthodox, Anglican, andLutheran churches. It is recorded by Irenaeus, who heard him speak in his youth, and by Tertullian, that he had been a disciple of ﻿John the Apostle. Saint Jerome﻿ wrote that Polycarp was a disciple of John and that John had ordained him bishop of Smyrna" From Wikipedia list of Martyrs. Paul the Apostle (Greek: Παῦλος Paulos; c. 5 – c. 67), originally known as Saul of Tarsus (Hebrew: שאול התרסי‎; Greek: Σαῦλος Ταρσεύς Saulos Tarseus), was an apostle (though not one of the Twelve Apostles) who taught the gospel of Christ to the first-century world. He is generally considered one of the most important figures of the Apostolic Age. In the mid-30s to the mid-50s, he founded several churches in Asia Minor and Europe. Paul used his status as both a Jew and a Roman citizen to advantage in his ministry to both Jewish and Roman audiences. From Wikipedia on Paul the Apostle...Neither the Bible nor other sources say how or when Paul died, but Ignatius, probably around 110, writes that Paul was martyred. Christian tradition holds that Paul was beheaded in Rome during the reign of Nero around the mid-60s at Tre Fontane Abbey (English: Three Fountains Abbey). By comparison, tradition states that Peter, who was not a Roman citizen, was given the more painful death of being crucified upside-down. The Martyrdom of Paul, which occurred in Rome about 67 AD by Roman Authority. 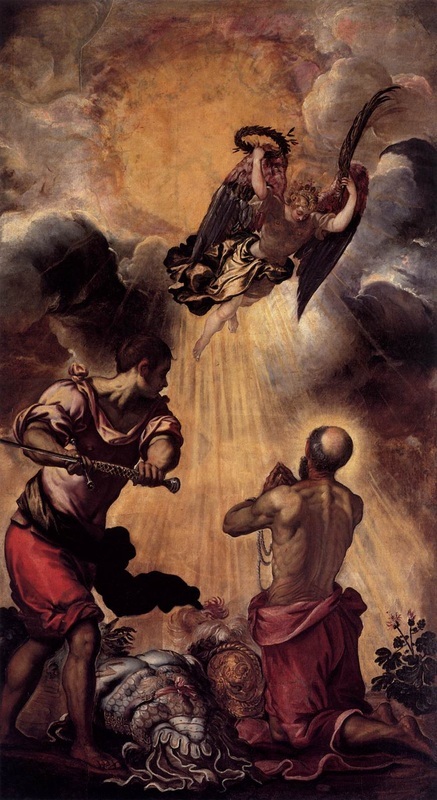 Painting by Tintoretto in 1556 public domain on Wikipedia.